Russ on Reading: Beyond Grades: How Are We Doing? Beyond Grades: How Are We Doing? In previous posts I have argued that we need to move away from grades as a method of assessment because grades are a poor way to provide feedback to students and also a poor way to provide feedback to parents. In this last in the series on grades, I will argue that grades are also a particularly poor way to provide feedback to schools. Throughout the country the grading of schools has become fashionable. Florida, under the leadership of reform minded Jeb Bush, was the first state to adopt A-F grading for schools. since that time 15 other states have hopped on this bandwagon. These grades for schools are largely based on student performance on standardized tests. 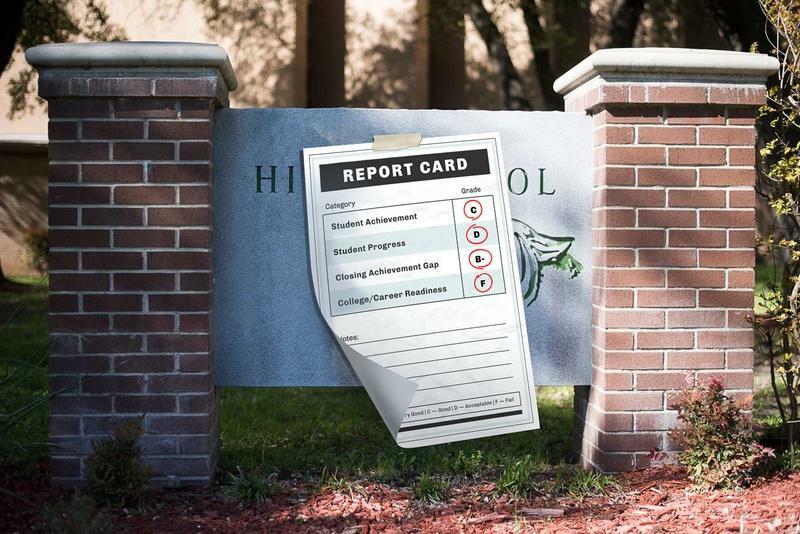 Corporate education reformers have sought to use school grades as a whip to make what they see as struggling schools shape up. Grading schools in this way has great appeal to legislators, because it allows them to give the appearance of caring about the quality of education without having to actually provide any resources that might help improve education in places that are wracked by poverty and years of inattention. Grading Schools on an A-F basis is a bad idea for many reasons. The National Association of Secondary Principals cites several reasons in their white paper opposing school grades. No decision about a school's performance should be based on a single data point or single test. Information from any accountability system should target school improvement, not high-stakes consequences. I would add that grading schools in this manner leads to a narrowing of the curriculum to focus on tested subjects, the destruction of morale for low performing schools in high poverty areas and a false sense of security for schools receiving high grades simply because their affluent students score well on standardized tests. Is there a better way to hold schools accountable? Of course. The trick is that providing schools with useful feedback requires time, commitment, vision and resources; things that simply assigning a grade does not require. The best way to hold schools accountable is to provide a dynamic assessment of the kinds of opportunities they are providing to their students. The school recognition program Schools of Opportunity* has developed guidelines for evaluating schools based on just such a concept. Currently, Schools of Opportunity is a small, all volunteer organization working each year to recognize schools that are providing great opportunities for their children despite many obstacles. The Schools of Opportunity template is one that every state in the country could emulate to truly hold schools accountable for serving children. Here are the things that this group says good schools must do. Create and maintain a healthy school culture free of bullying and welcoming to all students and adults. Broaden and enrich school curriculum to include all core subjects, physical education, health and the visual and performing arts. Provide more and better learning time during and after the school year through extended school days, clubs and activities and summer programs. End disparities in learning opportunities reinforced by tracking. Use a variety of assessments designed to respond to student needs, inform teachers on instructional priorities, and to help administrators make programmatic decisions. Reassess student discipline policies to focus on keeping students in school. Support teachers as professionals through strong mentoring programs, professional development and time to meet and work with colleagues. Provide adequate resources to support a well-maintained, clean, safe, school environment. Address key health issues through a professionally staffed responsive health facility. Build on the strengths of language minority students by viewing language minority students as assets from whom all can learn. Expand access to professionally staffed libraries and well-maintained and easily accessible internet resources. I highlighted the "use a variety of assessments to respond to student needs" to emphasize the difference between a school grade approach and an "opportunity" approach. Since No Child Left Behind, standardized tests have been the key, and often the only, measure of school quality used to hold schools accountable. When NCLB came along in 2002, most schools used standardized tests on a limited basis, often 3 times in the life of a school child, to inform administrators and teachers how kids were doing based on a measure that had some generalizability across schools and school districts. After 2002 standardized tests spread to every grade level and were used for high stakes purposes such as retaining students, firing teachers and administrators, and even closing schools. The problems with using standardized tests for high-stakes accountability are many and have been recounted often. For a summary, you can read this document from Fair Test, a national testing watch dog group. Suffice it to say here, that standardized tests do little to help teachers adjust instruction or to inform students of their needs. A "school of opportunity" needs a variety of measures to fulfill its mission of designing an accountability program that provides actionable feedback to teachers, parents, and students. Standardized tests do have a role - a small one. Given three times during a child's school career (and not used for any high-stakes decision making) standardized tests can help a school, a district, and its parents get a rough idea of how well the school is doing in meeting students needs. Much more important to administrators, teachers, students and parents, however, would be the regular formative and summative assessments that are used by teachers working with students in the classroom each day. One promising assessment tool that is appearing in more and more schools is the common assessment. The common assessment is a kind of half-way house between the formative classroom assessment individual teachers use in the classroom every day and the standardized test that is mostly disconnected from the actual classroom. In a common assessment, a group of teachers who are teaching the same subject, say Environmental Science in Grade 9, from the same curriculum, work together to design an assessment based on what students at that school are expected to know and be able to do in Environmental Science. By designing the common assessment, the teachers agree on expectations for students and on how student learning will be measured. Teachers are free to instruct in ways most likely to help children to achieve the desired goals, so autonomy is maintained within the framework of the district approved curriculum. The strengths of a common assessment approach are many. Most importantly, teachers get information on what their students know and are able to do that can inform future instruction and students get feedback on their strengths and weaknesses based on a common set of criteria. Common assessments also give the teachers the opportunity to look at a variety of instructional methods for delivering the same content and then choose those methods that work best. This type of work gives a professional learning community real purpose and has a real impact as a professional development tool. Common assessments also fit nicely into the arguments I have made in previous posts about the weakness of letter grades in providing feedback to students and parents. These school generated assessments allow the teacher to tell students exactly what they know and are able to do and what they need to work on. Of course many and varied assessments make up the full picture for any school. Common assessments deal with academic aspects of the assessment. Other measures are necessary to judge climate, inclusiveness, and equity in a true school of opportunity. We must go beyond grading and look closely at what is happening in schools in order to provide our schools with useful, actionable feedback. That is what a true accountability system looks like. It cannot be done on the cheap and it cannot be done by a narrow minded focus on an A-F grade for schools. *Schools of Opportunity is a school recognition project co-directed by award-winning former public school principal, Carol Burris and University of Colorado professor, Kevin G. Welner. You can learn more about the group and also learn how to nominate your school for recognition by going to the group's web site here.